We have been enjoying the festivities that this time of year brings and have been elf(ing) around with the family. I hope that you all have a wonderful Christmas, 2011 is on its way and I have a feeling that terrific, beautiful things lay ahead! 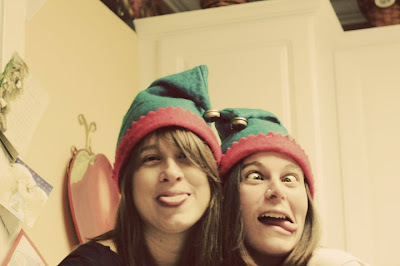 I smile because you are my sister, I laugh because there is nothing you can do about it! We HAVE the house and are in the waiting phase while construction begins... floors to be taken out, doors to be hung, fresh paint on walls, cabinets to be built, etc etc etc. Lots of photo's will be coming! hehehehehe! Cute picture! Merry Christmas!